Arts Fishing Club makes their musical berth in Nashville, TN and travels primarily throughout the midwest and east coast. Their sound blends modern indie-folk (Gregory Alan Isakov, The Head and the Heart, and Jose Gonzales) with classic 90s jam bands (Dave Matthews Band, Phish, OAR) to create a unique take on acoustic rock that will make you dance one moment and search your soul the next. In addition to the above influences, AFC is often compared to Edward Sharpe and Ben Harper. After completing a 1,600 mile 60+ show walking tour from Maine to Nashville as one of The Walking Guys (Google us! ), Christopher Kessenich (guitar/vox) has been focusing on Arts Fishing Club. He met Matt Siffert (bass) in spring 2016 at songwriters campfire. The two took to each others’ songwriting and began meeting to workshop songs. Then in late July, Kessenich was introduced to Peter Eddins (Keys) who landed in Nashville after completion of his Movie Scoring and Composition degree from Berkelee School of Music. The three began playing shows together and everything clicked. On AFC’s debut EP:The music drips with genuine reflection on classic stylings, including a bit of blues, pop, and certainly what we might call classic rock. 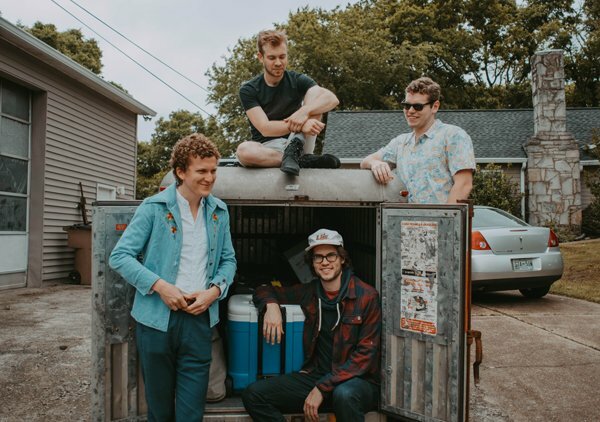 If you’re looking for a nice “kick back and enjoy” album, you can’t go wrong with Arts Fishing Club.” – Greg Jones / Ear To The Ground Music The group has gotten busy testing their sound on the road playing notable venues: The 40 Watt, Smith’s Olde Bar, Philly Folk Fest, and Newport Folk Festival. Arts Fishing Club is excited to be heading into the studio in Fall of 2017 to record their debut album.